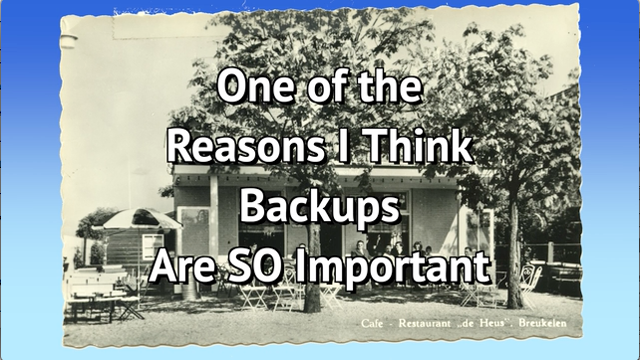 I have a good reason to always be talking about backups... Once upon a time everything was lost. Personally, I don't like that. I prefer to have cloud storage folders like OneDrive at the top, or "root", of my C: drive. Perhaps more practically, however, many people like to place these folders on another drive completely. Let's move the OneDrive folder. Continue Reading: How Do I Move My OneDrive Folder? 1.) What skills do you use every day to deal with others at work (co-workers and clients)? 3.) Do you think a class about human relations should be required for an Associates degree in computer programming? Why or why not? Normally, I don't answer homework questions. You'd be surprised at how many I get that are obviously someone trying to get me to do their homework for them. This one, besides appearing to be an honest question as part of an honest assignment, speaks to something I feel strongly about. It's not something I would have guessed when I started my career in computer programming. … and yet way more important. Continue Reading: Are Human Relations Skills Important in Tech? I connected to my WPA-protected Wi-Fi network ages ago, and now I can't remember the password. How do I figure out what it is? It's not at all uncommon to set up a wireless network securely, and then get on with your life, neglecting to write down the encryption password you created. Later, when it comes time to add another device, you're unable to remember that all-important password. It's so secure, even you can't get in! A backup is nothing more than an additional copy of data, ideally kept in a different location than the original. It's generally recommended that important data be backed up in at least one, ideally more, separate devices or media, such as an external hard disk. In addition, it's recommended that critical data also be backed up in another physical location, such as a different building, or online. More than anything, the important concept is that there never be only a single copy of important data. That's not backed up. Leo, if you really are intending to keep using your Samsung Galaxy Note 7, I hope you're on Verizon. Password length/complexity is actually not as important as many people think. Passwords mainly get compromised in one of three ways. Database theft and phishing are by far the most common, and the complexity of the password does nothing to help in such scenarios (a complex password can be stolen or phished as easily as a simple password). The third way is for it to be guessed or otherwise discovered by a dishonest friend/family member/co-worker. In this scenario, complexity does help, but a password does not need to be enormously complex to defeat the attacker. Password checkers, such as the one I linked to above, assume that somebody will be running cracking tools against your password. In the real world, however, that simply does not happen (unless, that is, you're specifically targeted because your laptop is loaded with trade secrets worth millions). To be clear, I'm not suggesting that strong, long passwords shouldn't be used - it's easy to do, so you may as well do it - simply that it's not necessarily as important as people think. Actually there is an argument for complexity - or at least length - in the case of database theft: brute-force (or rainbow tables) in conjunction with poor password database design. The shorter/simpler your password is the more likely it is to be able for a hacker to try all possible passwords against a stolen database. At a minimum it's trivial for them to try huge databases of known or common passwords. As I said, good database design can make this significantly more difficult - but the opposite, poor database design, can also make it next to trivial for the hackers. And, sadly, we keep hearing about compromises where it turns out the stolen database was implemented poorly. This is one of the reasons I've started promoting length over complexity. A short 8 character password can now be compromised no matter how complex it is. The odds of a longer (say 16 character) password being compromised in that manner are significantly smaller. The societal implications of mass surveillance are enormous. In fact, it could very well turn out to be the biggest issue of our time.